The majority of material for the Pennsylvania College of Dental Surgery Records were transferred to the University Archives from the School of Dental Medicine Library (Accession Number 2015:018, May 2015), with some records moved from the Dental School Library Historical Collection (UPC 4.11). The Pennsylvania College of Dental Surgery Records are organized into three series: Records, Publications, and Philadelphia College of Dental Surgery. The Records and Philadelphia College of Dental Surgery series are arranged alphabetically, while the Publications Series is arranged by publication type then chronologically. 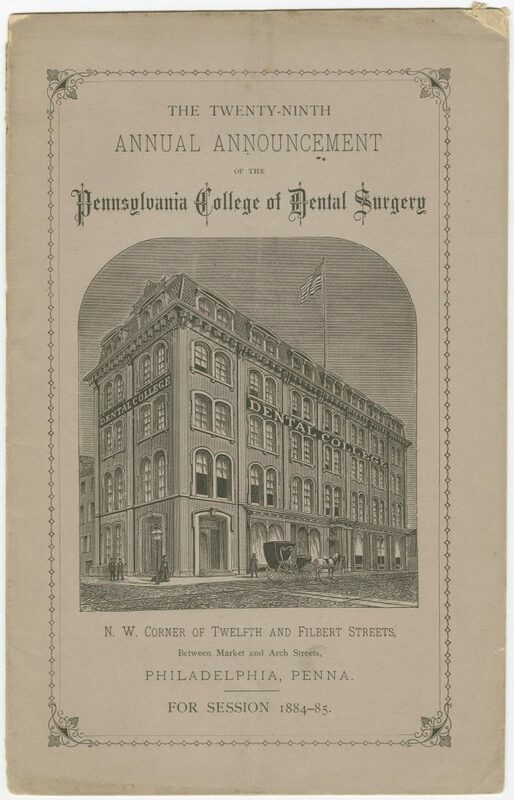 Pennsylvania College of Dental Surgery was founded in 1856 with Henry C. Carey as President, with the faculty consisting of many of the former members of the closed Philadelphia College of Dental Surgery. The College initially operated at 528 Arch Street, then moved to Tenth and Arch Streets. The school suffered two setbacks in the nineteenth century. The first in 1863 when a number of its faculty left to found the Philadelphia Dental College. Later in 1877, the University of Pennsylvania approached the school regarding a possible merger to create a School of Dental Medicine at Penn. While the official reply was no, Dean Charles J. Essig, and Drs. Edwin T. Darby, George T. Barker and James Tyson were invited to join Penn’s faculty and formed the Department of Dentistry which opened in 1878. By 1909 the College was short on funds needed to expand the faculty and modernize its equipment. That year a merger with the University of Pennsylvania was approved, forming the School of Dental Medicine at the University of Pennsylvania. The Pennsylvania College of Dental Surgery Records document the administrative activities of the school. The Records series consists of faculty and trustee minutes for the history of the school, while the publications series is composed of annual announcements from the nineteenth century which list the courses offered and names of officers, faculty, and students enrolled in the school. The Philadelphia College of Dental Surgery consist of the first announcement and a reunion program. There are no student records in the collection. Philadelphia College of Dental Surgery.